A prehistoric granary in Bears Ears National Monument. Photo by Josh Ewing/Courtesy Bears Ears Inter-Tribal Coalition. Established in 1906, the Antiquities Act is one of our country’s most important conservation tools. Born out of necessity in the last quarter of the 19th century, the Act was created to stop careless development of federal lands and purposeful commercial artifact looting that threatened to permanently erase our nation’s natural, prehistoric, and historic heritage. At the time, the need for enhanced federal protection was clear. Arguments made by scientists in the burgeoning field of archeology pointed to Russia’s unbridled collection of indigenous Alaskan artifacts, England’s museum of prehistoric relics gathered from the Mississippi Valley, and a Swedish expedition’s pillaging of vast amounts of pueblo artifacts from Colorado and New Mexico, especially from the extraordinary communal ruins of Chaco Canyon. In the face of these threats, and after a generation of advocacy and struggle, President Roosevelt signed the Antiquities Act into law on June 8th, 1906. Provisions of the Act have been utilized by nearly every president since (more than a century of bi-partisan conservation), protecting 161 of our nations most culturally and scientifically significant spaces as National Monuments. 32 of these monuments would eventually become National Parks, including Utah’s Arches, Wyoming’s Grand Teton, and South Carolina’s Congaree. Beginning with President Roosevelt’s first designation of Devil’s Tower in Wyoming, monument status now protects everything from vulnerable marine environments in the Pacific Ocean to Redwood forests in California, ancient dwellings in the American Southwest, locations significant to the civil rights movement in the American South, and much, much more. 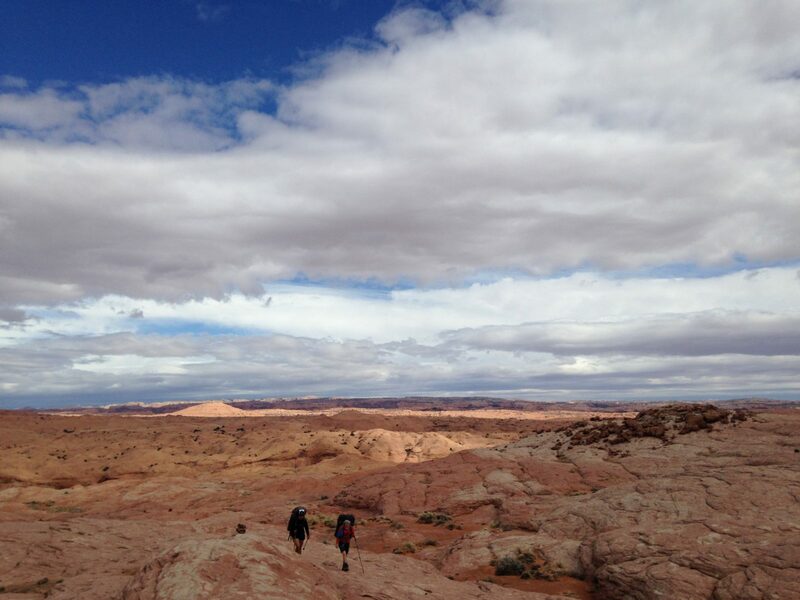 Backpackers, Sin Saber and Bria Rubie, in Grand Staircase-Escalante National Monument. Photo by Marcel Gaztambide. By any measure, the Antiquities Act has been successful in preserving – for all Americans – those pieces of our country, and its history, that are deserving of special recognition and protection. Much like the public demand that led to the creation of the Antiquities Act over 100 years ago, this presidential authority still enjoys broad public support. 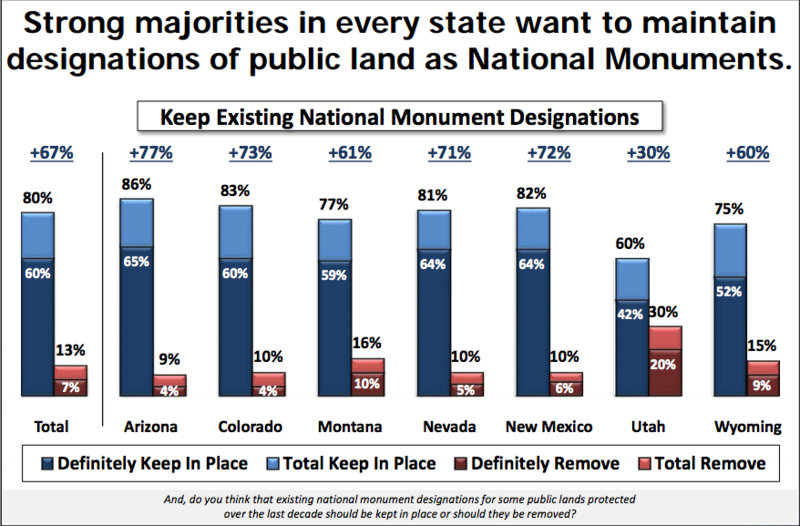 According to a new poll released by Colorado College’s State of the Rockies Project, 70% of western voters are more likely to identify as conservationists (up 7% from last year) and strong majorities in every polled state want to maintain designations of public lands as National Monuments. Source Colorado College State of the Rockies Project, 2017 survey of western voters. It is curious, then, why some western politicians, in direct opposition to their constituents, continually push for legislation that would shrink existing monuments, do away with them completely, or weaken/abolish the Antiquities Act. 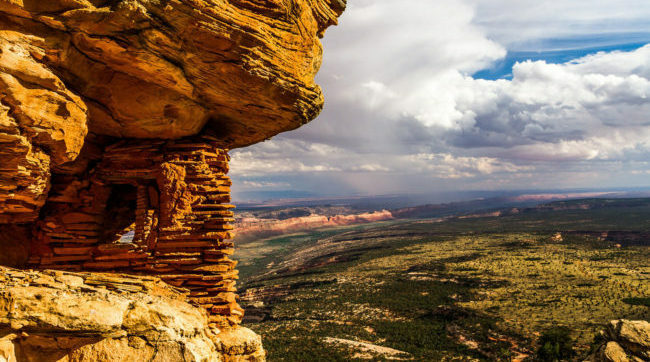 Most recently, Utah House lawmakers passed resolutions asking President Trump to take the unprecedented step of rescinding the new Bears Ears National Monument and asking Congress to shrink the 20-year old Grand Staircase-Escalante National Monument. Should President Trump or Congress decide to act on either of these resolutions, a dangerous precedent would be set that would directly threaten the conservation legacy of this country. There are nearly 60 National Monuments in the four corners region alone, including the first historic and prehistoric monuments like Chaco Canyon, El Morro, Gila Cliff Dwellings, and Montezuma Castle, as well as more recent monuments such as Chimney Rock and Canyons of the Ancients, whose future protections would no longer be guaranteed. It is critical that citizens across the country (and especially in the West) stand in defense of our public lands and, in particular, our National Monuments. The Antiquities Act, which has helped preserve and defend so much of our national heritage, now needs defending itself.